Endoscopists must be familiar with the macroscopic and histologic type of neoplasias, the potential for malignant conversion, and the kinetics of local and metastatic spread. Investigation into the morphogenesis of early cancer has revealed at least five different morphologic pathways of carcinogenesis in the colon, three different pathways in the stomach, and at least two in the esophagus. These pathways exhibit distinct macroscopic precursor and early malignant lesions. 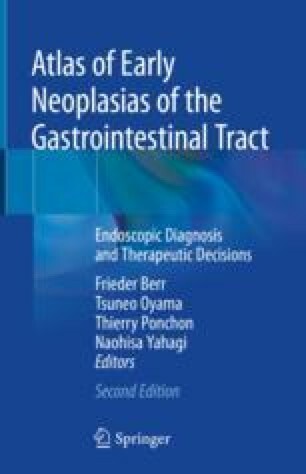 Endoscopic resection R0 en-bloc is curative in mucosal T1a and incipient T1b submucosal differentiated carcinomas of the gastric, esophageal or colonic wall. Apart from histologic grading and lymphatic or venous vascular invasion, vertical submucosal extension of early cancer predicts the probability of established lymph node metastases. To define the vertical and lateral margins of tumor infiltration after en-bloc resection, the specimen must be documented endoscopically and macroscopically and sent oriented to the pathology laboratory to obtain a precise pathological statement for decision on further management and follow-up. The authors gratefully acknowledge Susanna Mueller, M.D., Department of Pathology, Ludwig-Maximilians-University Munich, Munich, Germany; and Manfred Stolte, M.D., Institut für Pathologie, Kulmbach, for proofreading of the chapter and focusing on the formal differences in histopathologic criteria of cancer diagnosis used by Japanese and Western pathologists.